Build an integrated anticoagulation service with DAWN Clinical Software, supporting a range of care models through continuous development of new communication, integration and measurement tools. 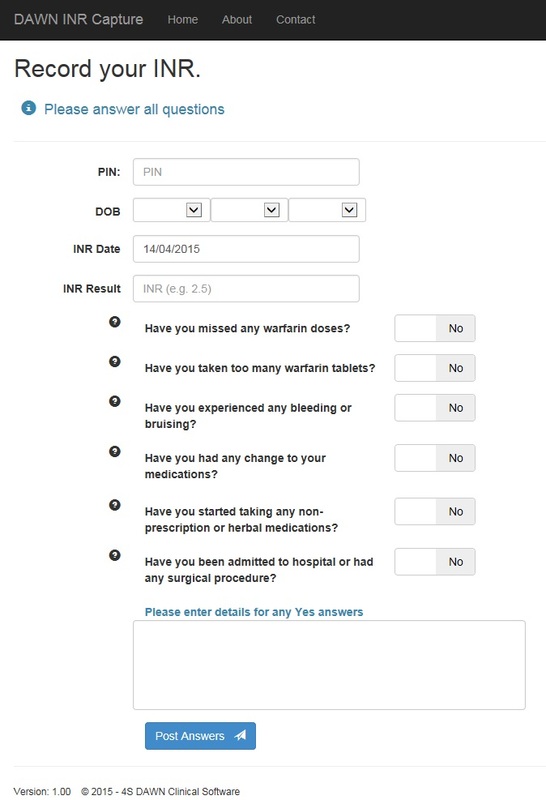 A quick and easy, web-based, mobile/tablet-friendly way for INR self-testers and phlebotomy services to capture INR results and supporting information and send it to physicians, specialist anticoagulation therapy management systems such as DAWN AC or electronic medical records. In built checks / verification means that the INR result can be imported straight into your DAWN AC patient record via an interface message in the same way INR results can be imported from a laboratory system. DAWN INR Capture is compatible for use with PC, Laptop, Tablet and Phone. The VGR measurement looks at the variability between a patient’s INR values, to determine how ‘stable’ they are. A study was carried out that looked at the possible value of an additional procedure to the %TIR; the VGR, a method of measuring INR variability and/or control, for the prediction of clinical events of bleeding or further thrombosis. S Ibrahim, J Jespersen, L Poller – On behalf of the European Action on Anticoagulation. Journal of Thrombosis and Haemostasis 11:1540-1545, 2013. The study determined that INR monitoring with a measure such as the VGR on a shorter-term basis and %TIR (i.e. 3 or 6 months before the current INR measurement) may offer additional safety by detecting and isolating patients who maybe at increased risk of possible adverse episodes. The VGR calculation has now been incorporated into DAWN AC and sits at the top of the patient record alongside %TIR. 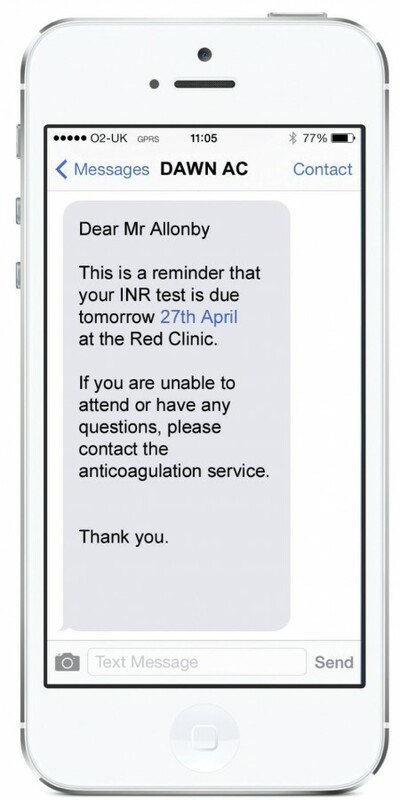 The DAWN AC system is now able to send messages as emails or SMS to patients and healthcare professionals. The Novel / Target Specific Oral Anticoagulant modules from 4S DAWN enable you to safely and efficiently manage your patients on either Rivaroxaban, Dabigatran or Apixaban, ensuring safe prescribing and follow-up of patients. Structured questionnaires for initiation and follow-up are utilised, covering age, INR preconditions, comorbidities, contraindicated and interacting drugs, creatinine clearance calculation, compliance and adverse events, among others. All information captured in the questionnaires is closely integrated with the patient’s overall treatment plan and a history of all treatment plans along with cessation reasons is provided with lists available to follow-up and track patients. 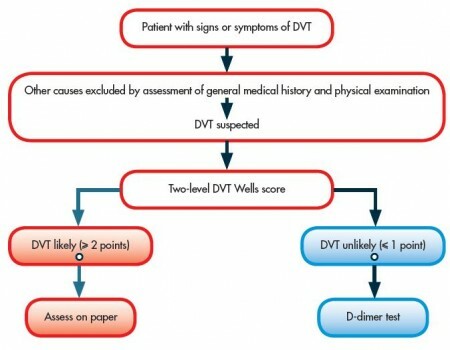 Important steps in the patient care pathway are documented electronically with DAWN VTE Diagnosis and Assessment and lead you through established protocols via visual flowcharts. Questionnaires ensure that all the required information is collected from the patient and no steps in the process are overlooked. Summary information is displayed on the surface of the patient record giving visibility of the information collected. One of the most time consuming and potentially error prone steps in the assessment process is reporting the assessment outcome to the patient’s GP or the referring clinician. By utilising DAWN’s in-built messaging system to email, fax or mail, this step can be executed in a single click! DAWN AC can work in conjunction with a telehealth platform to enable patients to self-test and report the INR over the phone. Later in the day once the patient has been dosed in DAWN, an automated telephone message is sent to the patient detailing the dose and next test date. Integration with the same platform can enable dose and next test date information to be pushed back directly to the patient’s EMIS or SystmOne record. DAWN AC can now be integrated directly with a medical record system in order to import patient medication information. This enables the patient’s ‘Drugs’ tab on the DAWN AC record to be automatically updated with the latest position in terms if the medication prescribed to the patient. A list view in DAWN AC gives visibility of any patient record that the interface has added or amended a medication on. In the first six months of operation, the first customer to adopt this interface identified 300 instances where the dose or next test date was amended on the strength of information being imported via the interface. For more information about any of these new developments or to see demonstrations of the products, please contact the 4S DAWN team today on sales@4s-dawn.com or 015395 63091.